The PANCAP Regional Coordinating Mechanism (RCM) recognizes that in order to serve the public interest and fulfill its core functions it: a) must involve diverse stakeholders, interests and perspectives; b) promote transparency, accountability and integrity and build public trust; c) engender a culture which is sensitive to actual, potential or perceived conflicts of interest and intolerant of misuse of position; and d) address Conflicts of Interest as required by the Global Fund by institutionalizing a Conflicts of Interest Policy and associated procedures. 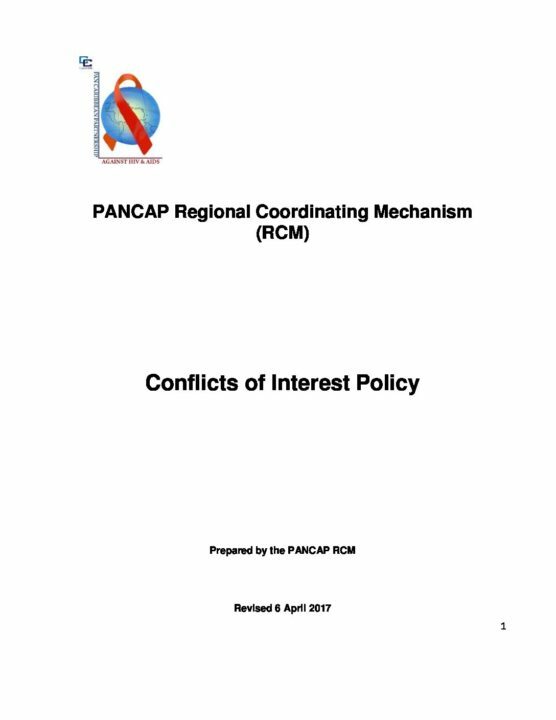 Moreover, the PANCAP RCM is aware that, due to its composition, conflicts of interest currently exist and are likely to occur in the future. This Conflict of Interest Policy and its associated procedures provide guidance in identifying and addressing actual, potential and perceived conflicts of interest. It is based on clear definitions of potential areas of concern, a duty to disclose conflicts, and outlines procedures for managing these conflicts as they arise. By establishing comprehensive Conflict of Interest Policy and procedures, each RCM member and alternate, the Secretariat staff, and the RCM as a whole, will be able to transparently manage all conflicts of interest and benefit from maintained integrity and high reputation required to efficiently perform their public duties.